Tomorrow, 1st May 2011 is MayDay - Help "Save Our Archives"
Keeping in theme with Preservation Week, talked about in our previous post, know that tomorrow, May 1st is MayDay! Whether you manage your own personal archive, a society archive, institutional archive or all of the above, MayDay is a call to action to make sure that collections are protected. After all, that is a fundamental responsibility of all archivists! The Society of American Archivists gives ideas and resources on what you might do as an individual or as the staff of a repository! 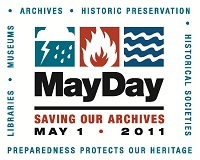 You can help “save our archives” by participating in MayDay 2011! As genealogists and family historians we almost invariably create mini-archives and become archivists of family treasures. These treasures might be documents, objects (e.g. clothing, tools, medals, etc), media (e.g. photos, audiocassettes, movie film, digital formats, etc) and much more. 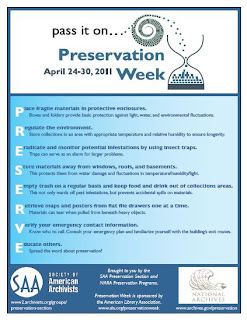 This past week (24-30 April 2011) has been Preservation Week and maybe an archive or library or repository near you did some special programs related to the conservation of our ancestors treasures. 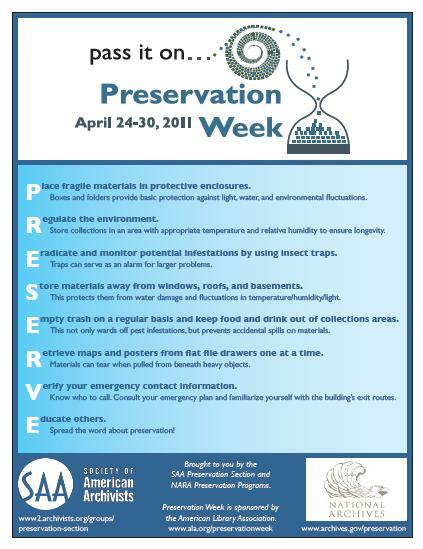 As part of this celebration the Society of American Archivists and the National Archives created a poster with some helpful tips about preservation. Please do share this information with anyone you know who by being a genealogist, family historian or through some other role has in essence become an archivist! Do you have any special tips and tricks for how you preserve items in your archive? If so, please do post a comment and share! I have a lovely 1875 silk wedding shawl that currently sits in my safe because I really don’t know what to do with it and I want to be able to pass it down through my family or eventually donate it somewhere for display. I bet everyone of you has something similar that you or someone else is the “keeper” of … and you may or may not know how to best PRESERVE it for future generations. Maybe we can all help one anther make sure these treasures survive. The Federation of Genealogical Societies (FGS) announces the debut of My Society, the first Internet radio show dedicated solely to genealogy societies. Broadcast weekly each Saturday at 1:00 pm Central, My Society will host discussions of genealogy society topics with a variety of guests including well-known genealogists and genealogy community leaders. This unique media outlet can be accessed at http://www.blogtalkradio.com/mysociety. Each week, My Society will focus on a selected topic relevant to genealogy society management and the role societies play within the genealogy community. Future topics will discuss increasing membership, developing a social media and Internet presence, member services, and more. In addition, each episode of My Society will spotlight a member society of FGS and discuss their various programs and offerings. Using the Blog Talk Radio platform, listeners will not only be able to hear a live broadcast, but they will also be able to call in and speak with the show's host and guests to discuss their own genealogy societies. The Federation of Genealogical Societies (FGS) announces its new series of genealogy society management education delivered online in webinar format. As part of its new online education initiative, FGS will offer webinars both free to the public and to its member societies via the popular GoToWebinar® platform which can accommodate up to 1,000 participants. FGS members will also have access to recorded webinars and syllabus materials at the members-only section of the FGS website at http://www.fgs.org. The first webinar, Social Networking for Genealogy Societies, will be held on Saturday, April 30, 2011 and is free to the public. FGS Board member Thomas MacEntee will demonstrate how genealogy societies are currently leveraging the power of Facebook, Twitter and blogs to expand their online presence and recruit new members. Register at https://www3.gotomeeting.com/register/401693254. Administration and Member Services: Joining a Genealogical Society; How to Promote Volunteerism in Your Society; How to Create a Member Handbook; Developing an Excellent and Cost-Effective Educational Programs for Your Society; and Using Bylaws to Focus and Motivate Your Society. Marketing: Developing a Publicity and Marketing Plan; Methods for Promoting Your Society's Meetings; Developing a Social Media Plan; Creating a Facebook Page; Creating and Using a Twitter Account; Your Society's Next Generation: Reaching Out to New Communities; and Creating an Effective Press Release. Technology: How to Attend a Webinar; How to Host a Webinar; Google Docs for Societies; Google Forms for Societies; Backing Up Your Society Data; Creating a Free Website for Your Society; and Creating a Blog for Your Society. Finances and Fundraising: Complying with IRS Filing and Reporting Requirements for Your Non-Profit Society; Society Fundraising Through Affiliate Marketing; and How to Set Up and Use a PayPal Account. We are extremely excited about this series and are committed to helping genealogy and historical societies improve their operations and expand their membership reach. 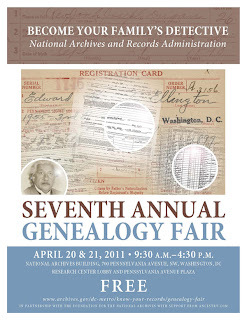 If you were in DC last week you might have visited the Seventh Annual Genealogy Fair sponsored by NARA. It was a great event – many activities to choose from, classes to take, vendors to visit and so much more. More than likely though, most of you were not in DC and so missed the fair! And, even if you were at the fair, with three talks given in each time period and no duplication, you weren’t able to attend all the sessions anyway. Though NARA cannot re-create the excitement of the actual fair, they have done the next best thing. They have created a page with handouts from many of the various talks given. These are a great resource to how to use some of the records kept at our National Archives! Republication of UpFront articles is permitted and encouraged for non-commercial purposes without express permission from NGS. Please drop us a note telling us where and when you are using the article. Express written permission is required if you wish to republish UpFront articles for commercial purposes. You may send a request for express written permission to [email protected]y.org. All republished articles may not be edited or reworded and must contain the copyright statement found at the bottom of each UpFront article. 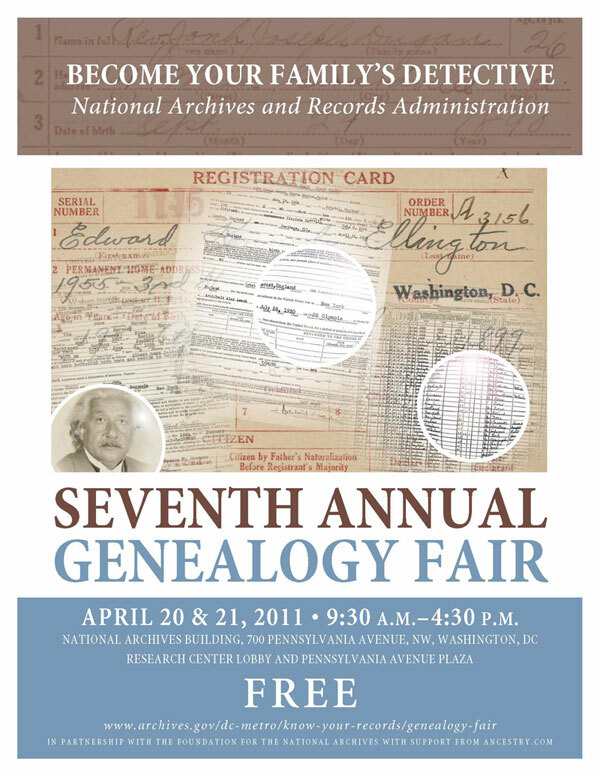 ARLINGTON, VA, 25 APRIL 2011: The National Genealogical Society proudly announces the release of its newest educational course, Introduction to Civil War Records, developed by renowned military expert Craig Roberts Scott, CG. It will debut at its thirty-third Family History Conference in Charleston in South Carolina, 11 - 14 May 2011. 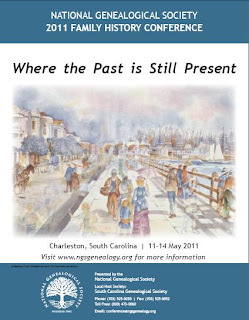 The NGS 2011 Family History Conference will be located at the North Charleston Area Convention Cener, 5001 Coliseum Dr., North Charleston, South Carolina. Even though you have registered for the conference, you are expected to check-in and pick up your conference bag, program and syllabus on CD (Printed syllabus, if pre-ordered before early bird deadline). Please bring you ID to check-in. 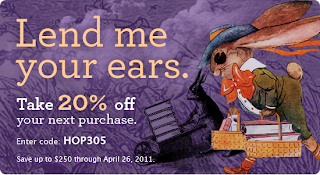 Lulu.com Sale -- 20% off Purchase Through 26 April 2011 -- Genealogy Research Resources You May Not Have Known About! If you haven’t checked out Lulu.com for genealogy resources, you might be missing out on some helpful books, cds, etc. 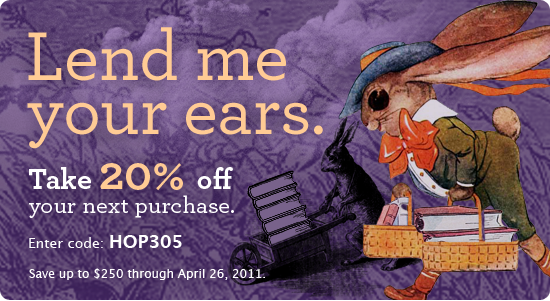 Since a “sale” always helps, know that through 26 April 2011, Lulu.com has a sale for 20% off your next purchase. Save 20% Code = HOP305. For those of you unfamiliar with Lulu.com, it is an on-demand publishing service for books (numerous formats including e-versions) and CDs and more! This has become a publishing option for societies and individuals who do not want or cannot afford the cost of bulk printing or want more flexibility with being able to readily revise a publication. I know for a fact that both individuals and societies have materials that are only available via Lulu. Search on “Wake County” (NC) and you’ll find materials published by its genealogy society (Wake County Genealogical Society) and also books by individuals covering mill petitions, road and bridge records, cemetery records and more. A search on the term “genealogy” brings up 3118 results while there are 627 results for the term “genealogical.” I found entries under “court minutes” and then deeds (with the word county) brought up entries for select counties in Georgia, North Carolina, Tennessee and Maine. Are you seeking tax records, a search on tax (with the word county) brought up records for select Kentucky, Virginia, North Carolina, and Mississippi. So, do check out Lulu.com and you might find some genealogy resources that will help your own research! The blog article by this title gives us some food for thought as you head into what will be a long weekend for many. There is a cost for everything we do as genealogists – whether in money or time. And, time is often money. Though the blog piece focuses on “tangible” genealogy research assets, it’s just as true with regards to time. Whether you do genealogy as a hobby or as a professional, we are always making choices about how much time and money we have to devote to our genealogy research. I can travel 4+ hours round trip to Richmond to do research or hire a local researcher or I can pay to access a database instead of hiring a local researcher or traveling to the repository (assuming that is feasible), etc. Something that is “free” for us to access did cost time and money (e.g. internet server space is not free, someone is footing the bill, genealogy journals required countless hours of volunteers transcribing, abstracting and indexing data, etc.). And, genealogy societies, such as your National Genealogical Society (NGS), are built, survive and thrive based on financial resources and volunteer efforts. As one big genealogy community, we might put effort and money into one society and reap the benefits via another. If you do benefit from genealogy resources that are “free” see if you can “pay back” with putting some of your time or money back into the genealogy community at large. I know that NGS, your state society, local county genealogy or history society, repository, archive, etc will always be appreciative of your involvement! And, your involvement is essential – no society can survive without members. Without volunteers, conferences and workshops can’t be held, publications won’t be produced, strong and unified voices advocating document preservation and conservation will be silenced. We are a community based on volunteers whose time is truly not “free” and yet freely given. Do you think your family tree might have British roots? Would you like to travel to Britain to discover your living relatives? Dragonfly TV is making an exciting new game show featuring families, ancestors and long-lost relatives. They’re searching for people from all over the world, who think they may have British (English, Welsh, Scottish) ancestry, who would like to take part. Whether your Great Great Grandfather was born in England or your Great Aunt lived in Scotland… If you think you, or anyone you know, may have any British ancestry, they want to hear from you! Editors Note: Thanks to the GenealogyBlog and Kimberley Powell, About.com Guide for bringing this to our attention.